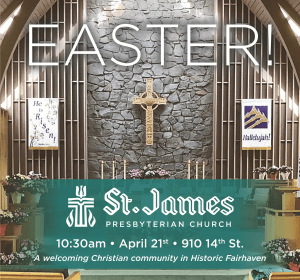 Our progressive, welcoming congregation in historic Fairhaven seeks a Worship & Music Leader to oversee our church’s music programs and lead musical worship at our weekly Sunday gathering. St. James has a historic legacy of high-quality musical offerings, including choral, orchestral, and organ music. The congregation is familiar with hymn-singing, praise songs, as well as contemporary musical pieces. The Worship & Music Leader works closely with the Pastor of St. James in the selection of Sunday morning music and assists in leading the congregation in worship. Please submit a cover letter & resume to pastor@saintjamespres.org.